Northern Ireland Secretary Theresa Villiers has said the round-table talks at Stormont this week have been "useful and intensive". Day-four of the discussions included plans for the new institutions to help address the concerns of victims and survivors. These were proposed as part of the Stormont House Agreement. Ms Villiers said the talks would resume on Monday to "discuss the impact of continued paramilitary activity". "We have had a series of detailed and focused meetings around legacy issues and the proposals for new institutions to deal with the past that the government published yesterday," she said. "These discussions covered a number of important issues that will help to shape the legislation we present to parliament next month." 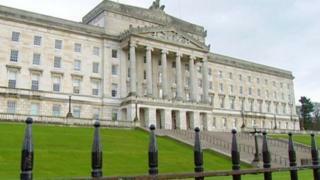 The Ulster Unionist Party (UUP) has expressed concern over some aspects of the legacy proposals. UUP MP Tom Elliott said: "Through the information retrieval process obviously perpetrators can give information to that commission which can be passed on to victims' families. "That evidence then cannot be used within any other judicial process that has been given to that information retrieval commission. "The problem there is that if the perpetrator or someone on their behalf then makes that public then obviously it can't be used in a legal process or in a challenge to them through a different system, in other words through the Historical Investigations Unit." A new body, the Independent Commission on Information Retrieval (ICIR), will be established to enable people to seek and privately receive information about the (Troubles-related) deaths of their next of kin. The information will be inadmissible in criminal and civil proceedings. The UUP is also concerned that the public have not been consulted on the legacy issues and the discrepancy over the disclosure of information between the authorities in the UK and the Republic of Ireland. Mr Elliott said that under the proposals, the British government would give full disclosure of any information it holds, while the Irish government have committed to provide disclosure of information, without using the word full. The round-table talks between Northern Ireland's political parties are aimed at finding a resolution to the crisis at Stormont. The political row was triggered by a police assessment that IRA members were involved in the murder of former IRA man Kevin McGuigan Sr last month. Police said the IRA still existed, but added that it was not engaged in terrorism. Three Democratic Unionist Party (DUP) ministers subsequently resigned from Northern Ireland's ruling executive, and Peter Robinson, the party's leader, stepped aside as first minister. The DUP and the Ulster Unionists agreed last week to join the round-table talks when the government ordered a review of paramilitary groups in Northern Ireland. On Tuesday, the government announced the names of the panel members who will oversee the independent assessment.